In 1926, the Missionary Oblates of Mary Immaculate opened St. Henry’s Preparatory Seminary at the request of Bishop Henry Althoff of the Diocese of Belleville, Illinois. The seminary welcomed its first 14 students on October 4 of that year — the first of nearly 3,000 students over six decades. Both Oblate and diocesan students were educated in a six-year program at St. Henry’s as preparation for the major seminary and, ultimately, the Roman Catholic priesthood. La Salette religious community joined St. Henry’s in 1969, and the Redemptorists joined in 1980. 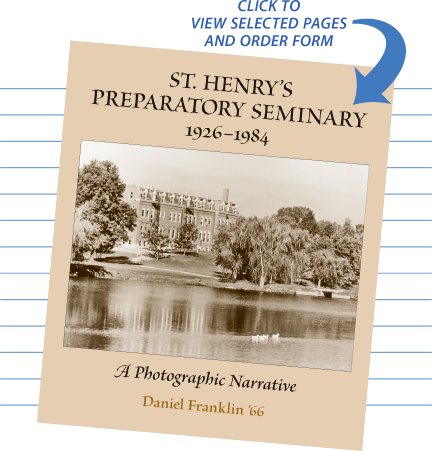 Dwindling enrollment (67 students in 1983–84), the small number of graduates continuing studies at a college seminary, and an impending staff shortage forced the closure of St. Henry’s in May 1984. Copyright © 2018 St. Henry's Alumni Association. | All rights reserved. Site developed and maintained by Village Webworks, Inc.